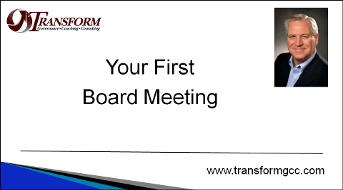 If you are new to being a Director you might wonder what to expect at your first Board meeting. This video will give you some key insights on governance best practices and how you can prepare for the meeting. Good governance practices promote the use of Director Orientations to help new Directors become effective as quickly as possible. You can get additional insights on what orientation should include and how to structure them in this video. Should you use an external advisor to improve your governance or strategic plan development? You can get some insights on the benefits of using an advisor and how to select one from this video. Good governance practices recommend that you periodically take stock of your overall governance situation. You can learn more about our approach to governance reviews or assessments in this video. What results can you expect from completing a review of your governance? In this video we explain the typical results and benefits of a review or governance assessment and how it can transform your Board and relationship with management. 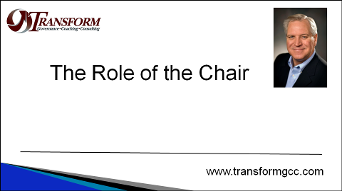 This video explores one of the key leadership roles on the Board - the Chair. This is a challenging position because the person must balance providing leadership, managing meetings and dealing with difficult people who, as Directors, are all equal. Board evaluations or assessments are typically performed every year as an annual check-up for the Board. This video explains what evaluation tools are used and what you can expect. A Board evaluation provides insights on what the Directors, and sometimes management, perceives as the current strengths and weaknesses of the Board. Learn more about the benefits of an assessment in this video. Good governance practices recommend a variety of ways of improving your Board's performance. This video explores some of the techniques we typically use with our clients.